When my mother’s birthday roles around I think long and hard on what the perfect gift to give this delightful lady. As I went from store to store nothing was speaking to me and then I remembered the best gift to give is your time. 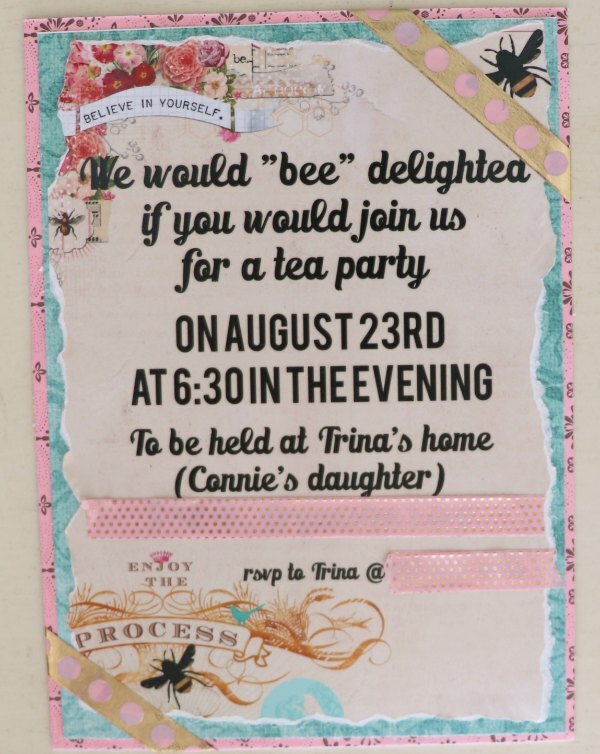 And what better use of my time than to throw a tea party for my mom and her friends. 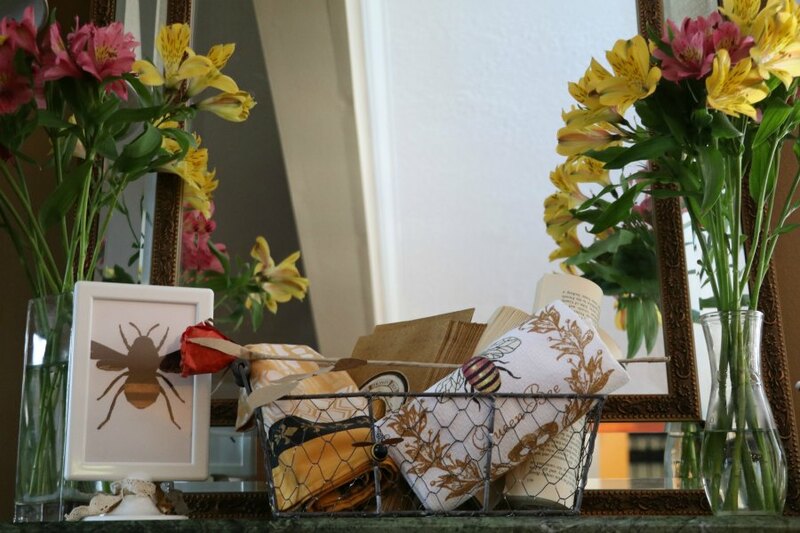 August is the month I enjoy decorating my home with bits and pieces of bee theme’s since those amazing honey bee’s are so busy at this time of year and I love bringing a bit of nature from the outdoors to the indoors. 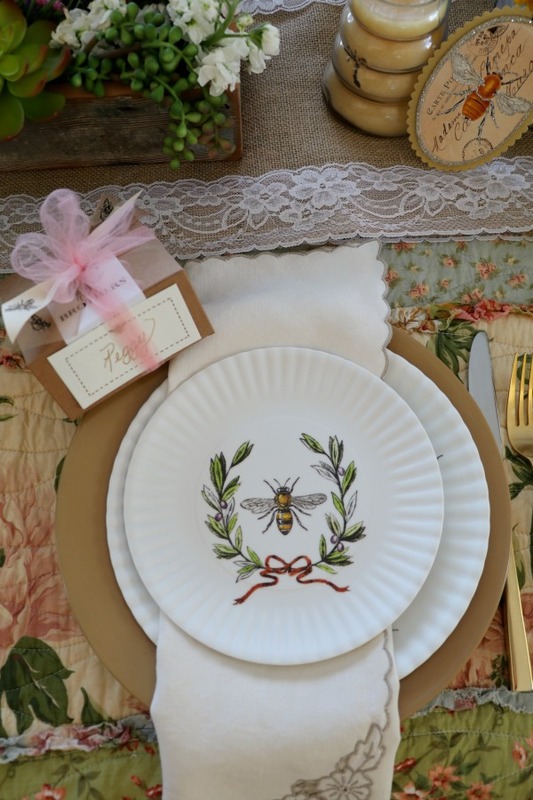 I spotted some new bee plates this year that are simply adorable and this was the perfect excuse to add them to my collection. 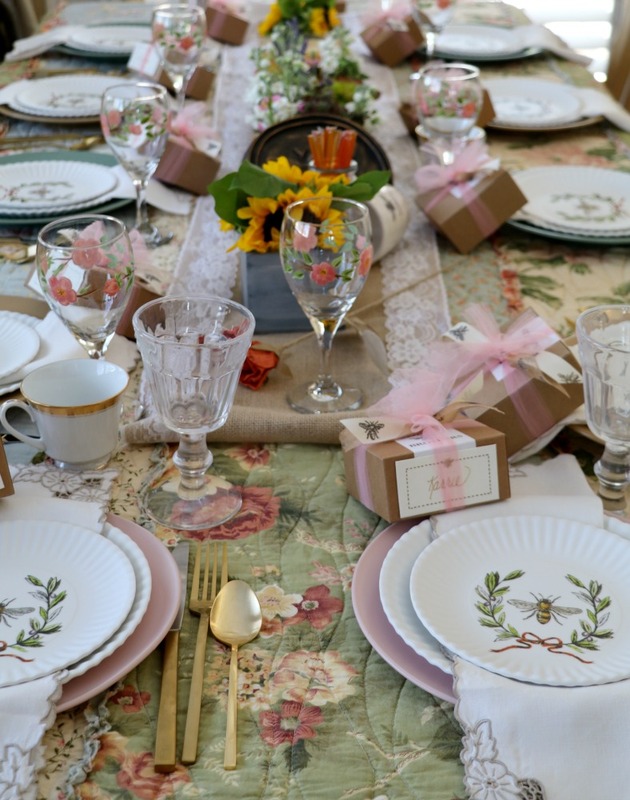 Since this was a tea party and not a regular dinner party I decided the table decor needed to be feminine with a floral vintage vibe. I played around with several tablecloths and then remembered I had a lovely vintage quilt packed away. After a fresh washing it was just what I was looking for. 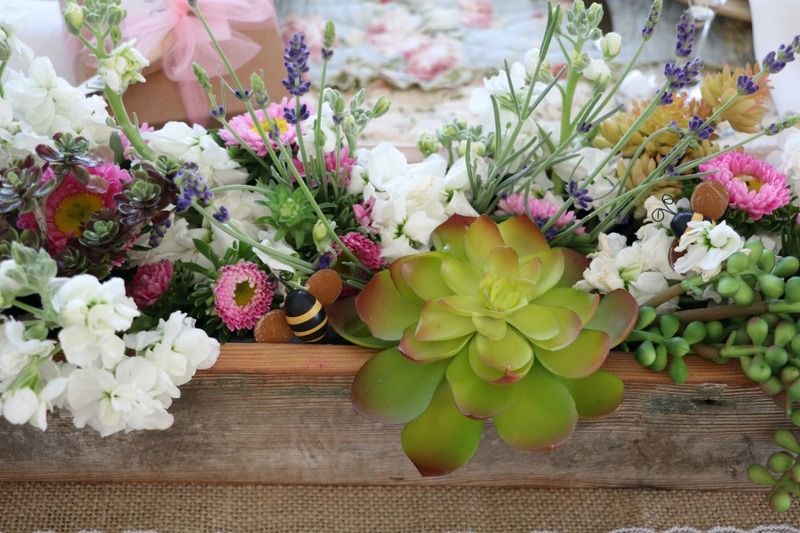 I used a simple burlap table runner (which also added to the vintage vibe) and kept the rest of the tablescape simple by bringing in nature with a rustic barn wood container which I used to create a floral arrangement. 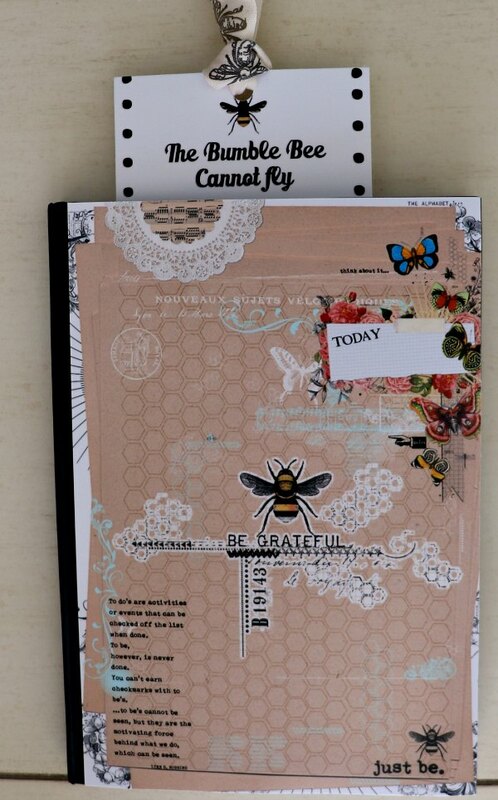 I then added bits and pieces from my bee collection. 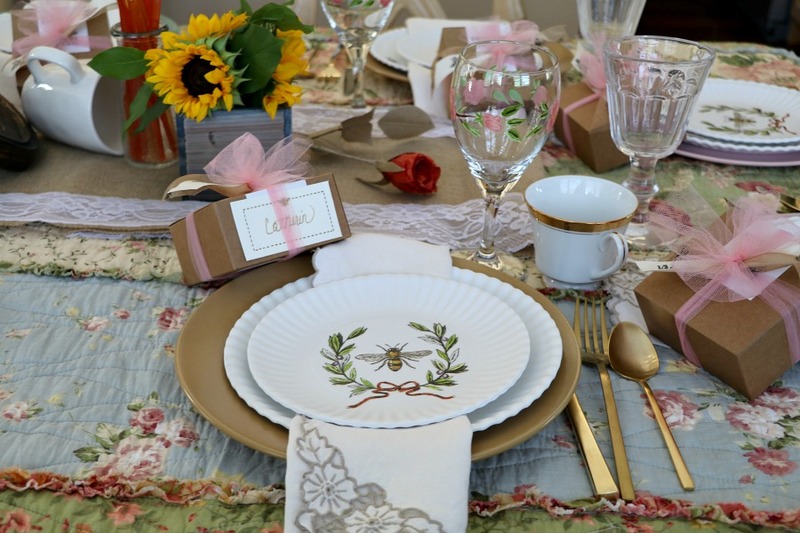 For each table setting I layered the new (adorable) bee plates over larger ceramic plates with vintage napkins. 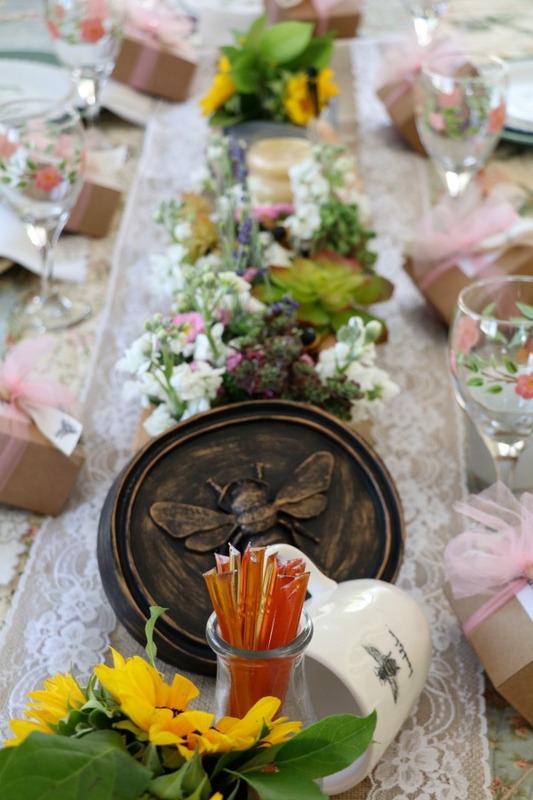 Each place setting had individual gift boxes filled with homemade honey caramels (which I ordered from bees brothers) and tied with bee stamped ribbons and name plates. Perfect way to use their name cards and party gifts as well. 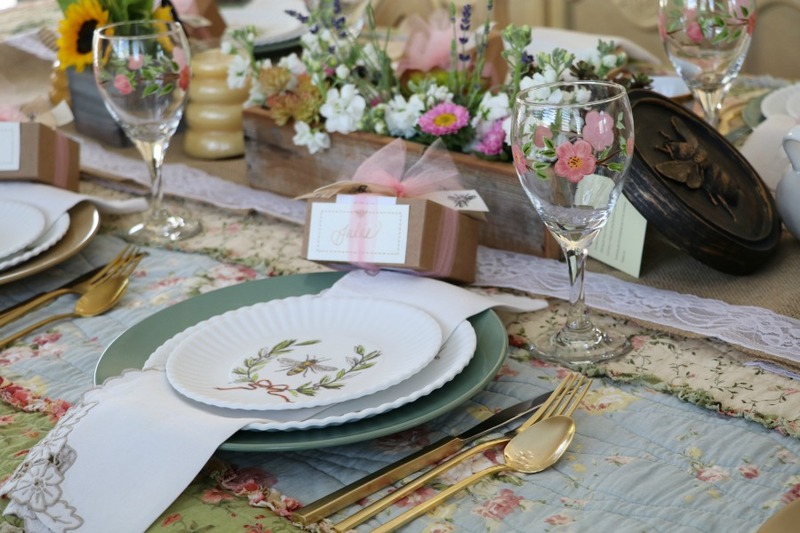 I loved how the table came together, it just spoke every inch of my mother. 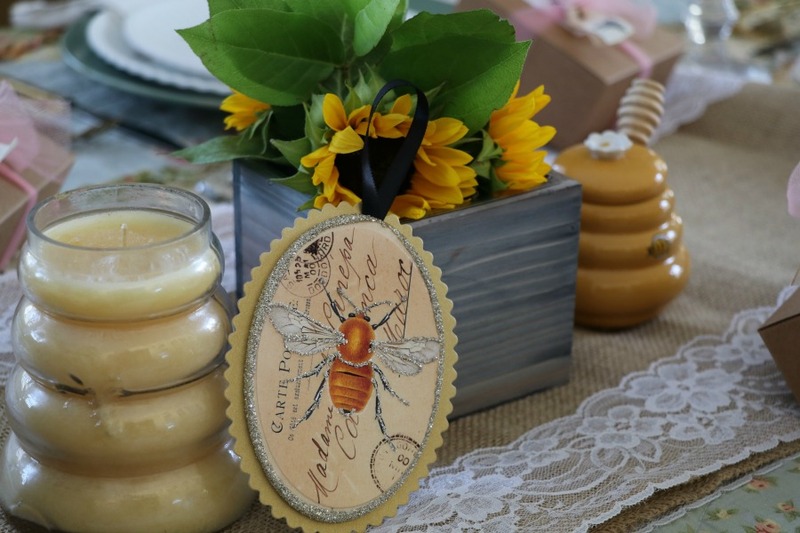 I wanted to bring the theme of Honey Bee’s into the party as much as possible so I planned the menu around honey as an ingredient. As an appetizer I served a slice of peach-basil-mozzarella flatbread. For the main course I served a peach salad with white balsamic-honey vinaigrette followed by honey baked chicken and white rice (I made extra suace from the chicken to pour over the rice as well) and homemade biscuits with honey. And for dessert I baked a honey bundt cake which was served with lemon honey ice cream. To top off the evening each guests was given a little “Bee Grateful” journal and “Bee Bookmark” and they each took a turn telling one another what they were most grateful for in life. What a most incredible atmosphere as I took this opportunity to participate . . . I actually didn’t know any of the 10 guests my mother had invited and yet by the end of the evening I truly felt I had gained 10 new friends. 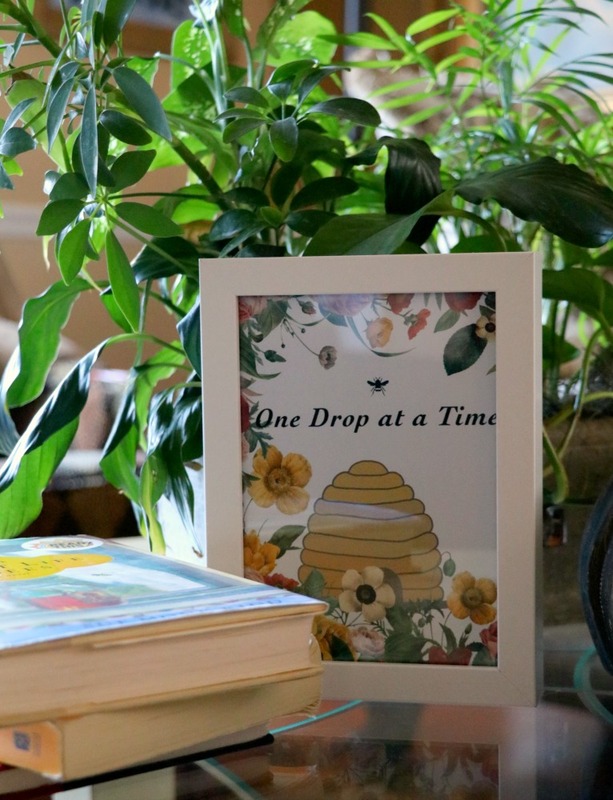 As I passed out the journals I took the time to share one of my favorite thoughts about the honey bee which I learned from M. Russell Ballard. Sometimes as women we wonder if our little efforts are making any difference at all in the world. Your simple daily efforts and acts of service do matter and are making a huge difference to others. I know this for a fact because so many of you have touched my life in doing so. It truly is about just one drop at a time. You my sweet daughter are amazing and I appreciate the effort you put into this amazing evening. I am sure my friends will remember this for many years to come. There is no doubt that I will remember this forever!! Love you my darling daughter. What a wonderful tables cape! 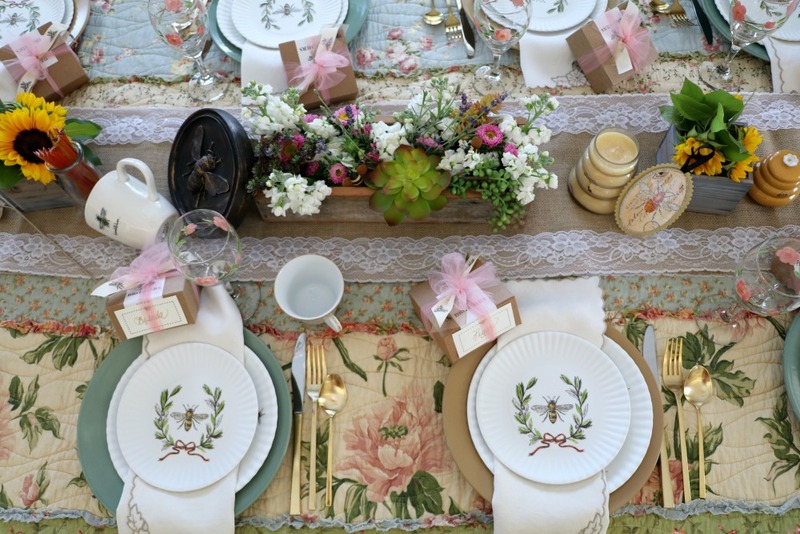 I love those bee plates and that wonderful invitation. The sentiment is wonderful too. Always so lovely to see your parties Trina. Gathering for your mom. How lovely!!! What a fabulous party! 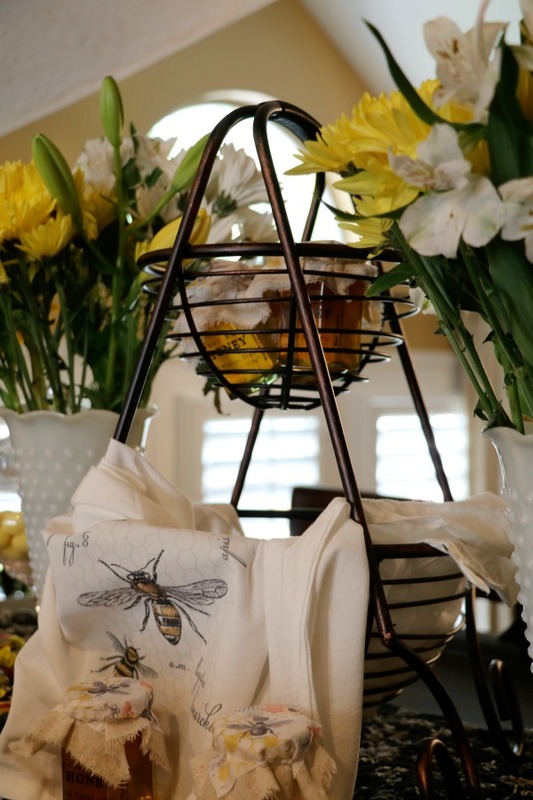 You have so many fun bee themed items. Looks so fun! 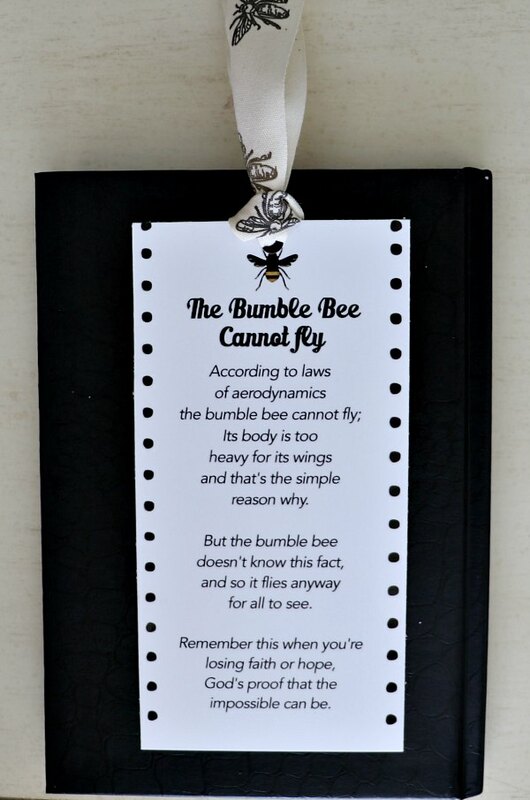 Ok, it would be trite to say that this post is the bee’s knees, but it is! 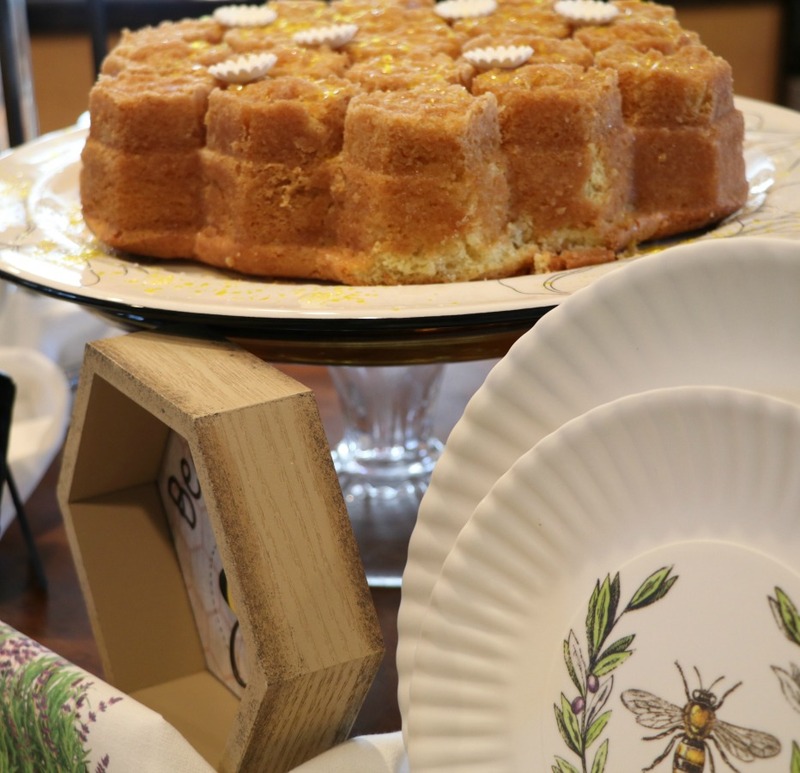 Every inch spoke to me as well, love the table setting, the bee themed plates, the lovely linens, the cake, the menu…I could of on and on, like a busy bee, 🐝! Fabulous, what a lovely tribute to your mom, and boy can you rock a ruffled apron! I have just found your site! I must tell you that I just leaned back, propped up my feet and read about your “ Bee 🐝 Party!” Made me long to sit to the side and listen to the buzz. Ever detail was perfectly darling!